If you only own one instruction course: This Is It! Have you learned dozens of solos, but never truly mastered any of them? You know all the notes, you've got it memorized, but when you get out in public you: freeze up, stumble, sweat, and break time? Where's the problem? Nervous in front of people? Is it lack of talent? Not enough time to practice? Is it because you're not in a band? Absolutely, positively 100% not guilty! It's simply because you are not practicing effectively! 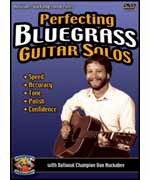 Dan Huckabee teaches you how to make the most of your practice time by laying down 23 secrets, & explaining each, step-by-step. These are the procedures you need, to achieve total & absolute mastery! Learn ten times as much�in 10% of the time�simply by following this unique, step-by-step system. You will learn several variations of a guitar contest favorite (Cotton Patch Rag) & conquer all physical, mental, & musical barriers to reach the summit of speed, accuracy, drive, polish, & complete confidence. Then, you can go back to all your old stuff, & master it too! How many private lessons, books, cassettes, & videos have you already bought? This program will help you to master all of them! The vast majority of people give up on guitar after really trying hard for several months or even years. The ones who are more diligent or stubborn keep on trying, but don't really progress as far as they would really like to. The few who really get good are solving the problems that are holding them back from making real progress. The same thing is true of golf, skiing, chess, computers, or anything else that's worthwhile. You really just need a system that will bust the little barriers holding you back. This video teaches the process for making you succeed at mastering any musical instrument in any style of music. Following this procedure is the easiest way to learn. Note: This is a 'Scripted Video'�every word was written like a screenplay�with hundreds of rewrites�until perfection was achieved. Then the dialog was read through a TelePrompter during the filming. This insures that no important details have been inadvertently left out of the production, and nothing is out of sequence. In other words; it is a very effective and well planned instructional product. -------------------------------------------------------------------------------- About Dan Huckabee Dan Huckabee, has a degree in Music from The University of North Texas. He won the National Dobro Championship, & has played with The Allman Brothers, Lyle Lovette, Nancy Griffith, & Robert Earl Keen Jr, just to name a few. Dan founded Musician's Worskhop in 1973, teaches Guitar, Dobro, Mandolin, & Harmony Singing at The University of Texas Informal Classes, has taught workshops & seminars at festivals all over the United States, & has authored over 250 music instructional products. So get comfortable & let Dan's lifetime of musical experience guide you through everything you need to know in the quickest & easiest way possible!